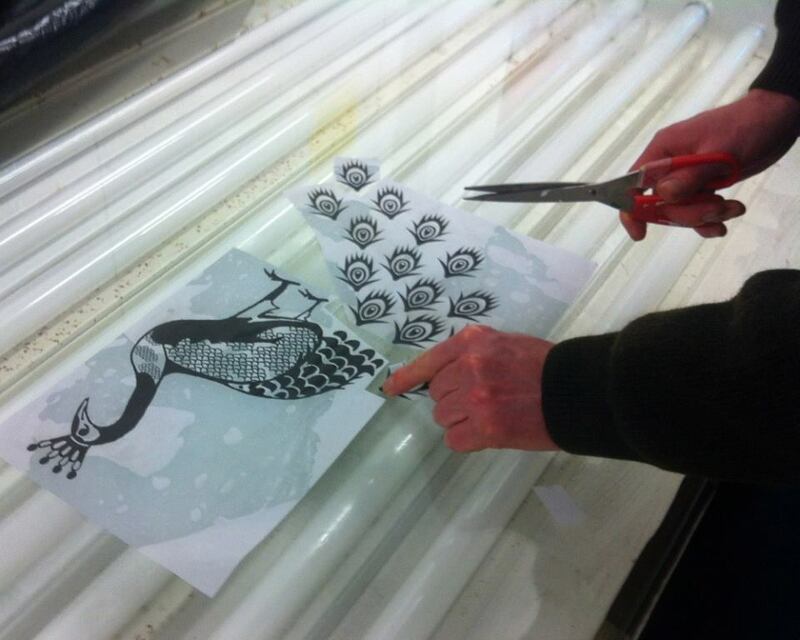 Screen printing offers many creative ways to develop editions of artworks. In this one-day workshop you will learn a key screen printing technique – how to create photo stencils. This is a hands on session that will take you through the whole process and arm you with tips to get the best results. The day begins with discussion of the process and examples artworks created at Medway Fine Printmakers, to see the range of marks that you can reproduce with screen print design. Then it’s on to reclaiming a screen with a high pressure washer, so that it is clean and ready to use. We’ll coat the dry screens with photo emulsion, and while they’re drying in the dark, start preparing your artwork. Exposing the screen on the light box is next, then washing it out to create the stencil. Finally we’ll be printing the screen onto your choice of paper or textiles. We have fabric printing tables to work on, or you can opt to use a printing board with hinge clamps. No experience is necessary, the class is suitable for beginners, and those wanting to refresh their screen printing skills. We’ll take a break for lunch (there are good cafes nearby), and you can have a look our other printing facilities or the library if you want to in this time. Creation of an A4 or A3 sized photo stencil. Open access sessions are available for people who have taken a screen printing course or have experience working with the equipment in our screen printing studio. It is recommended that you take the Screen Printing Workshop Two class to continue developing your skills and gain confidence to use the equipment on your own in the open access sessions. If you have any questions about the course or payment, please call or send us an email. Please give us as much notice as possible if you are not able to come to a course that you have booked. If you cancel with seven or more days notice, we will reschedule or refund your booking. For cancellations less than seven days before the workshop date – we may be able to offer you a discount on a future booking, but please note that we have to cover space, preparation and tutor costs and if you cancel at the last minute we still have to pay for these. On booking you will be sent details of the types of artwork that work best for screen printing. You can either bring along artwork to use, or create / copy something on the day. The general rule is to use clear black and white lineart with good contrast, and avoid grey tones and shading. The dark areas should be as solid a black copy as possible on lazer or inkjet print outs. You can bring along images on a memory stick, or print outs at A3 size (or two images at A4). If you don’t have your own design to work with, you can pick something from the studio’s design library with hundreds of illustrated and vintage books.